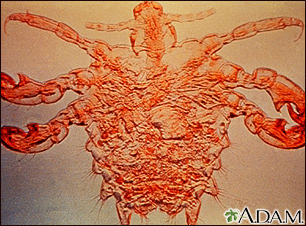 Pubic lice are tiny insects that infect the pubic hair area and lay eggs there. These lice can also be found in armpit hair and eyebrows. In very cases, pubic lice can spread through contact with objects such as toilet seats, sheets, blankets, or bathing suits (that you may try on at a store). Small gray-white oval eggs (nits) attached to the hair shafts in the outer genital area. 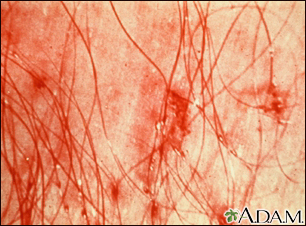 Scratch marks or signs of a skin infection. Because pubic lice may cause an eye infection in young children, eyelashes should be looked at with a high-powered magnifying glass. Teenagers with pubic lice may need to be tested for other sexually transmitted infections (STIs). Makes sure anyone with whom you have had sexual contact or shared a bed is treated at the same time. People with pubic lice should be checked for other sexually-transmitted infections when lice are discovered. Diaz JH. 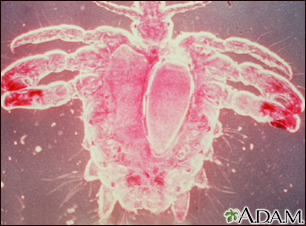 Lice (pediculosis). In: Bennett JE, Dolin R, Blaser MJ, eds. Mandell, Douglas, and Bennett's Principles and Practice of Infectious Diseases, Updated Edition. 8th ed. Philadelphia, PA: Elsevier Saunders; 2015:chap 294. Gropper JR, Levitt JO. Pediculosis. In: Lebwohl MG, Heymann WR, Berth-Jones J, Coulson I, eds. Treatment of Skin Disease: Comprehensive Therapeutic Strategies. 4th ed. Philadelphia, PA: Elsevier Saunders; 2014:chap 176.